Traveling to east Bali is another exciting experience. Better get prepared, we should be fit and take sarong with us. 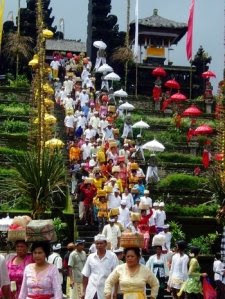 We’re going to hike to the biggest and oldest temple in Bali: The Mother Temple of Besakih. But before we go to Besakih, it is worth also to visit Klungkung. There are monument of Puputan Klungkung (as a remembrance of fight until death between the local kingdom of Klungkung against the colinialist Dutch), Hall of Justice or Kerta Gosa and the Museum. The Hall of Justice served like a court in the early 1900. It is a small hall of approximately 4×4 meters with wooden chairs in the middle of the hall. These were the seat of king, priest, and Dutch controller who decided what would be the punishment for the convict? On the hall ceiling you will see many Balinese traditional painting with Kamasan style. The theme of paintings are mostly life after death (especially scene of hell with many types of punihsment given to the sinful souls according to the bad thing they did in their past life) taken from the story of Bima Swarga and Tantri (Tantri is a long story with many stories inside it like the Arabian night tales). I think this painting somehow would create a shock therapy to the convict? to confess any kind of bad deeds s/he committed. When we finish at Klungkung, we can go to the Besakih which is only 20 kms away. 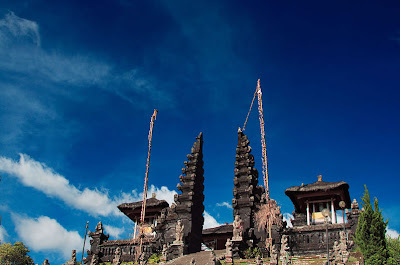 Besakih temple, built in around 8 century, is the biggest temple in Bali. 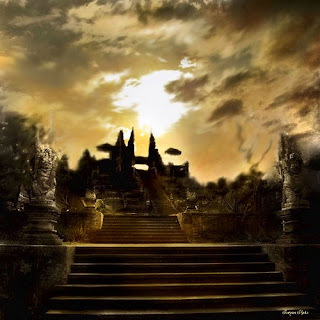 Located at the slope of the highest mount in Bali, the temple is actually a complex of 18 temples. You need to wear sarong to enter the temple and pay entrance fee Rp.10000 (USD 1,1). First you need to walk 400 metres from the parking to the temple. You arrive at the temple yard. From here you’ll see the main part of the temple where all the Balinese will go praying in this part. You need to ascend through stairs beside the main part of the temple until you get to the Pura Gelap, the highest point, where you can see the whole area of the temple. You can take picture of the beautiful panorama from here. Finishing our visit to Besakih temple, you will continue to Bat Cave Temple and Tenganan Village. Gua Lawah or the Bat Cave temple is a temple built just outside a cave where hundreds of bats flying and hanging on the cave wall. The legend says the tunnel of the cave ends up at the slope of Mount Agung. But there is no prove to it. The Tenganan village is a village where the Bali Aga (or the original inhabitant of Bali) lives. They have their own society system, art and culture. The local people of Bali Aga produce a kind of beautiful hand woven cloth called tenun ikat. This can be a very special souvenir to get from Bali.